Nicky Henderson's 8-11 favourite Angel's Breath was beaten at Kempton as 6-1 shot Southfield Stone claimed the Dovecote Novices' Hurdle. 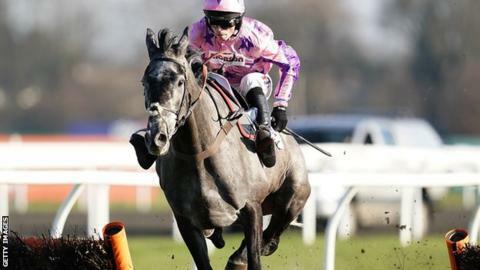 The five-year-old grey won on debut by four-and-a-half lengths over a mile and seven furlongs at Ascot in December. But despite a strong finish over two miles at Kempton, the gelding lost out by three-quarters of a length. Henderson said Angel's Breath remained on course for the Cheltenham Festival, probably the Supreme Novices Hurdle. The trainer said: "Angel's Breath needed the run and Nico [de Boinville, jockey] said he just took a blow at the wrong moment. It's sharp enough around here, but nobody is despondent and I still think two miles is the right trip on a stiffer track." Six-year-old Southfield Stone was also beaten when odds-on at Taunton last time out. Trainer Paul Nicholls said: "I probably wouldn't entertain Southfield Stone in the Supreme, but he could be one for a handicap. "He's in the Imperial Cup and might be one to leave for Cheltenham and go for a race at Aintree."